Busy sewing this week. Yesterday I realised I had work in progress in three rooms of the house! Dining room tables are for fabric aren't they? Maybe not! So I spent at least two hours folding and tidying. 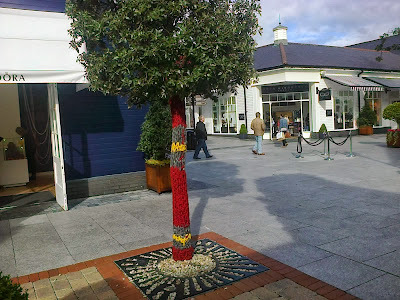 Last weekend we visited Kildare Outlet, an mini Irish version of an outlet village. It always reminds me of a little Woodbury Common ( from back in the days when I got to travel a lot more!). Its a beautifully maintained centre right next door to the National Stud (Horses that is!) and the Curragh in Co. Kildare. We found this time they'd gone a little mad with yarn bombing. Not an attempt to keep the trees warm as small boy suggested. One could forgive him for thinking that. These wolfhounds don't look too impressed. I think it was the colour combination! 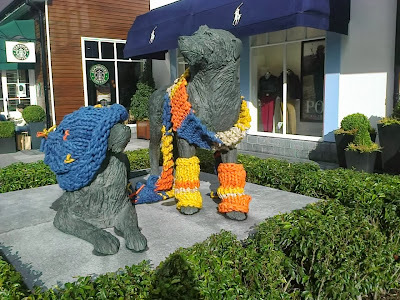 Any yarn bombing in your area? That is the cutest thing that I have seen in a while!!! Ha!!! Yarn bombing indeed...what a sight!!! Happy sewing this weekend friend!!!! It's the newest thing in Ireland at the moment, spreading everywhere! Not sure if was necessary last week but today I'm like those trees..!! 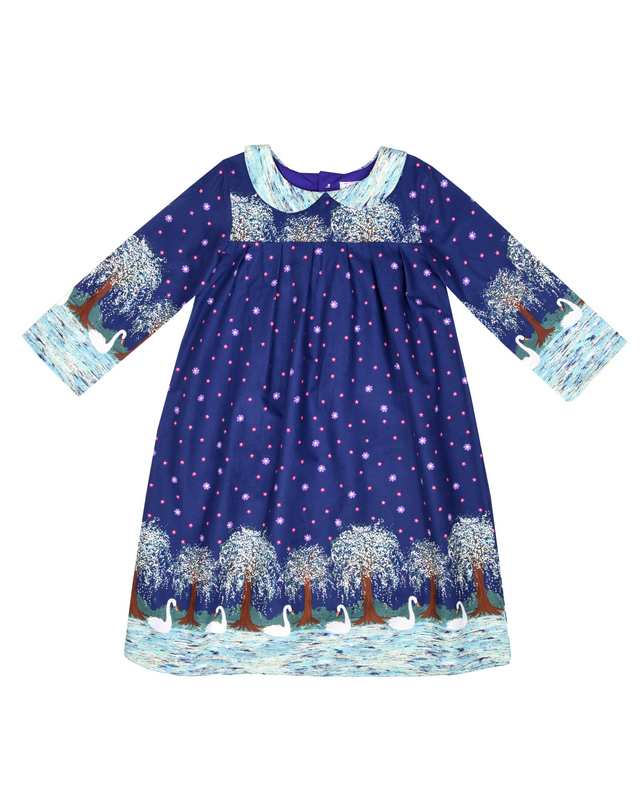 have a fun sewing ...and fun week ! This morning I was like those trees too!! Ah that's some fun and surprise for the little ones! It was great fun, all around the trees and lampposts! So yarn bombing is the term for that? I love it! And you are correct, the dining room table is the place for fabrics for sewing projects. It is indeed, its a great name alright, it says it all!